Abstract. A 1200×1200km2 area of the tropical South Atlantic Ocean near Ascension Island is studied with the HadGEM climate model at convection-permitting and global resolutions for a 10-day case study period in August 2016. During the simulation period, a plume of biomass burning smoke from Africa moves into the area and mixes into the clouds. At Ascension Island, this smoke episode was the strongest of the 2016 fire season. The region of interest is simulated at 4km resolution, with no parameterised convection scheme. The simulations are driven by, and compared to, the global model. For the first time, the UK Chemistry and Aerosol model (UKCA) is included in a regional model with prognostic aerosol number concentrations advecting in from the global model at the boundaries of the region. Fire emissions increase the total aerosol burden by a factor of 3.7 and cloud droplet number concentrations by a factor of 3, which is consistent with MODIS observations. In the regional model, the inversion height is reduced by up to 200m when smoke is included. 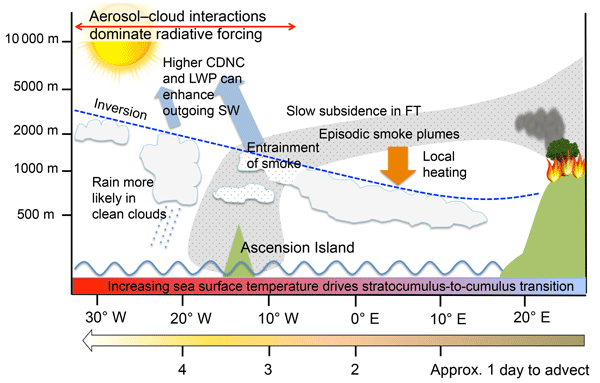 The smoke also affects precipitation, to an extent which depends on the model microphysics. The microphysical and dynamical changes lead to an increase in liquid water path of 60 g m−2 relative to a simulation without smoke aerosol, when averaged over the polluted period. This increase is uncertain, and smaller in the global model. It is mostly due to radiatively driven dynamical changes rather than precipitation suppression by aerosol. Over the 5-day polluted period, the smoke has substantial direct radiative effects of +11.4 W m−2 in the regional model, a semi-direct effect of −30.5 W m−2 and an indirect effect of −10.1 W m−2. Our results show that the radiative effects are sensitive to the structure of the model (global versus regional) and the parameterization of rain autoconversion. Furthermore, we simulate a liquid water path that is biased high compared to satellite observations by 22% on average, and this leads to high estimates of the domain-averaged aerosol direct effect and the effect of the aerosol on cloud albedo. With these caveats, we simulate a large net cooling across the region, of −27.6 W m−2. How to cite: Gordon, H., Field, P. R., Abel, S. J., Dalvi, M., Grosvenor, D. P., Hill, A. 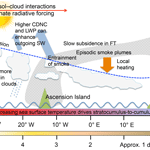 A., Johnson, B. T., Miltenberger, A. K., Yoshioka, M., and Carslaw, K. S.: Large simulated radiative effects of smoke in the south-east Atlantic, Atmos. Chem. Phys., 18, 15261-15289, https://doi.org/10.5194/acp-18-15261-2018, 2018. Smoke from African fires is frequently transported across the Atlantic Ocean, where it interacts with clouds. We simulate the interaction of the smoke with the clouds, and the consequences of this for the solar radiation the clouds reflect. The simulations use a new regional configuration of the UK Met Office climate model. Our simulations indicate that the properties of the clouds, in particular their height and reflectivity, and the fractional cloud cover, are strongly affected by the smoke.